In Mike Judge's 2006 comedy classic Idiocracy, civilization's growing consumerism and dwindling intelligence have resulted in a planet of imbeciles. These morons solely refresh themselves and water their crops with a sports drink named Brawndo: The Thirst Mutilator. Decades of pouring neon electrolytes on America's agricultural belt have resulted in a nationwide dust bowl, but everyone is too stupid to figure this out. After all, why would anyone pour "toilet water" (i.e. fresh water) on plants? Plants crave electrolytes, because everyone craves electrolytes! That's the Brawndo slogan. 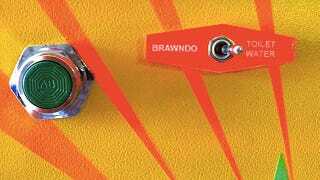 As a tribute to the most powerful energy drink on Earth, Dave Dalton and Craig Berscheidt of Kansas City's Hammerspace have built this fantastic Brawndo drinking fountain. Only minutes after the fountain was finally assembled, I had the great pleasure of testing it out on out unsuspecting (and thirsty) UPS man. When given the choice between BRAWNDO and TOILET WATER, the UPS guy quickly selected BRAWNDO. "I've never seen one of these before...is this a new drink?" He went back for seconds, and proclaimed that it was good. I call that success. For those of you who have never seen Idiocracy, here is a scene of President Dwayne Elizondo Mountain Dew Herbert Camacho's cabinet explaining the societal cachet of Brawndo.